The vivo V15 Pro teaser posters tend to focus on its 32MP pop-up selfie camera, but a new report shows that the triple camera on the rear shouldn’t be underestimated. The rear camera will feature a 48MP main module (a Samsung GM1), which supports a 12MP pixel binning mode for night shots. The other two modules will have 8MP and 5MP sensors, though their purpose is unclear. This is only vivo’s second triple camera phone after the NEX Dual Display (which had a depth sensor and a 3D ToF camera). Anyway, the vivo V15 Pro will be among the first to use a Snapdragon 675 chipset. This means its direct competitors are the Redmi Note 7 Pro and Motorola P40, which will also have 48MP cameras. The phone will have a Super AMOLED display (size and resolution TBD) and an in-display fingerprint reader (visible in the poster). There's no notch or punch hole camera, obviously. 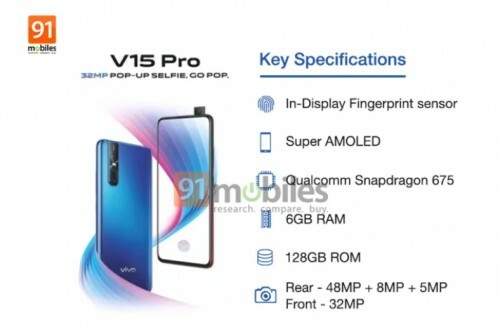 The V15 Pro will be unveiled on February 20 and is expected to cost INR 25,000 ($350/€305) for a unit with 6GB of RAM and 128GB storage. 48MP camera with a SD675? That will be what, 2 pictures per minute due to how long that processor will take to write that big an image to storage? Better have 8Gb or more RAM for caching that image till it gets passed to storage.